Upgrade to Free at Sea from £49pp and choose 2 of the ** Offers. Book a suite and receive all applicable offers at no additional cost. Enjoy 1 to 5 (depending on length of cruise) dining opportunities in selected speciality restaurants. Norwegian Breakaway is ready to whisk you away to your best holiday yet. Take a Caribbean cruise and swim with dolphins, step back into history on a Europe Cruise, or just enjoy relaxing days on a Transatlantic voyage. Named Best Cruise Ship for Families by USA Today, there’s something on board for everyone. Breathe in the fresh ocean air and connect with the sea like never before along The Waterfront, a quarter-mile oceanfront promenade lined with restaurants, bars, and spectacular views. Indulge in more than 25 dining experiences, including three new, dedicated seafood venues. And enjoy dazzling Broadway performances - Rock of Ages, Burn the Floor, and Cirque Dreams & Dinner Jungle Fantasy. 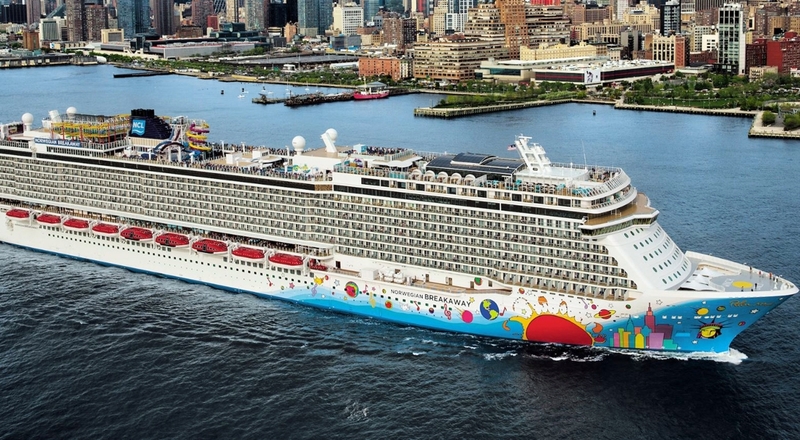 Norwegian Breakaway offers magnificent amenities at sea. Flexible accommodation ranges from the affordable to the over-the-top opulence of the Suites and Penthouses, perfect for a special occasion. Enjoy dance classes aboard Norwegian Cruise Lines. Families play better together on Norwegian. From dodgeball to cupcake decorating, there are lots of activities all over the ships. Plus, with complimentary youth programmes, kids can learn to juggle at Circus School in Splash Academy and teens have the coolest themed parties in Entourage.